Anaheim Hills, CA- American Motorcycle Specialties, USA announced today it has revamped its original line of Comfort Max Gel Pads to offer today’s riders’ unparalleled comfort on any bike, or any style of riding. 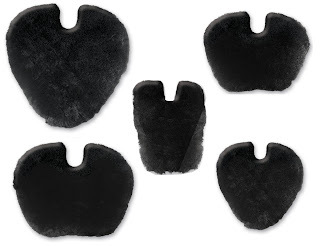 The very popular and innovative tail bone notch is now included on all five sizes. Additionally, a thick layer of soft contouring memory foam covers the molded gel on top, and a second layer of firm memory foam covers the bottom. This new dual-density foam covered gel provides a new ultimate in rider comfort. At the core of the Comfort Max Gel Pad is an advanced Viscoelastic molded gel used in medical and sports applications, plus a top and bottom layer of memory foam that contours the rider, eliminating pressure points or “Hot Spots” which can cause rider discomfort. In addition, the memory foam/gel sandwich combination absorbs vibration, small bumps and road irregularities. 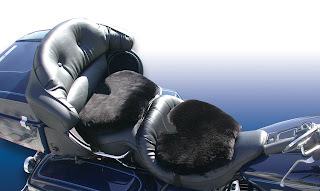 The addition of a Sheepskin cover offers the highest level of comfort available, priceless for long distance rides. It softly conforms to your shape and eliminates localized pressure. Genuine Sheepskin covers provide increased comfort and allow air to circulate, virtually eliminating perspiration in hot weather and providing warmth in cold weather. The Sheepskin wool cover is soft and resilient. Its fibers breathe, acting like a natural thermostat for your body, keeping you perfectly comfortable regardless of the weather. Comfort Max Gel Pads also feature a unique, maximum grip bottom. This rubberized surface prevents the pad from sliding off the seat and also comes with a removable strap. Comfort Max Gel Pads are available in five sizes to fit any seating application and come with a 30-day no hassle return policy. The molded gel is guaranteed a lifetime.